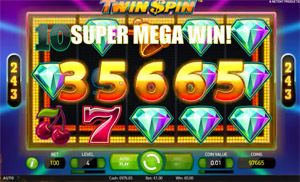 A lot of people love to play on the Twin Spin, it is one of the most popular video slots by NetEnt. When you get lucky on the Twin Spin you can hit it big, so no wonder that there are loads of people recording their screen when they play on the Twin Spin slot. The Twin Spin has as a special feature the Twinning Reels. This never seen before feature causes at least two adjacent, but otherwise randomly selected reels to be exactly identical. So from the start of the game your chance of getting that winning combination will double. Even better, during each spin, the Twinning Reels feature becomes contagious and can jump on to other adjoining reels! This Twinning Reels feature combined with the fact that the video slot has a whopping 243 ways to score a winning combination makes this game a must-try! I think Casino Daddy regretted immediately what he said: the first spin after he said the magical words “I am not ready to higher the bets yet” is straight away a big win! All five reels become Twinning Reels, and he gets a screen full of Jacks. He wins 243 times his bet. Two Super Mega Wins within a Minute! It seems like a screen full of Jacks is normal with the Twin Spin: Shirox hits them as well! Oh and if you wonder why they don’t get the same pay out: in the previous video the lad was playing “level 3” — with three coins per betting line– while Shirox was playing on level 2. This means that Shirox wins exactly 2/3rds of what the previous Youtuber won in coins. Good thing for Shirox is that he was playing with a higher coin value, so at the end, he wins more money. Higher stakes mean higher winnings! Shirox seemed to be pretty lucky: he hits another super mega win, within a minute after his screen full of jacks! Let’s hope he will invest his winnings in a better headset, so we can hear him next time better when he rakes in his next win! You should probably turn off your sound when you check out the next video clip, since the dude sound pretty annoying. Or maybe it is just because I saw the video clip like a 100 times. Guess the only thing you miss when you turn off your sound is that Mr Slotspinners shouts over enthousistic “Holy Diamonds” when he hits a bunch of diamonds. His diamonds are thanks to the 243 ways to win a super mega win. He wins a whopping 36000 credtis, since he is playing with 1 euro per spin that means 360 euros. Not bad for some holy diamonds! Is This a Real Twin Spin Big Win? The last video is a dubious one: someone seems to be playing on the Twin Spin with a stake of £50 per spin and hits it big! He wins a juicy £16,050! On the one hand, it looks like he is playing for real money at Ladbrokes’ online casino. But on the other hand: they guy who posted the video seems to be German, while he is playing with pound sterling. So would it be a real screen cap or is it a bit of photoshopping? The video continues for another 4 minutes after the Super Mega Win, where you will see that he increases his bet to £125, but there are no really big wins anymore. So if I were you, I would stop the video after the super mega win! If you are like me and can’t get enough of big win videos, check out the Starburst big win videos. If you want to know more about this slot, head over to Twin Spin Video Slot for an extended review. Do you want to try your luck? You can play this --and other video slots and casino games-- with real money at Unibet.co.uk, and you could claim a 200% deposit bonus up to £200 and up to 200 free spins.